Get a serviced and tested buffer board LJ92-02053A / LJ41-10376A used in Samsung PN64H5000AF plasma TV and then send your old dud to receive credit. Make sure to read the listing first! This is a listing for a serviced and tested replacement for Samsung upper buffer board LJ92-02053A / LJ41-10376A shown on the picture. LJ92-02053A is used in Samsung PN64H5000AFXZA plasma TV and possibly other models. Serviced buffer boards are usually used when brand new boards are either not available or offensively expensive. See the below section for more details of pros and cons of using serviced boards. If we are out of stock on this item chances are we may be offering a repair service where you can send your board and we may service, test and return it to you. If you do not see such a listing please contact us to request about such a possiblity! 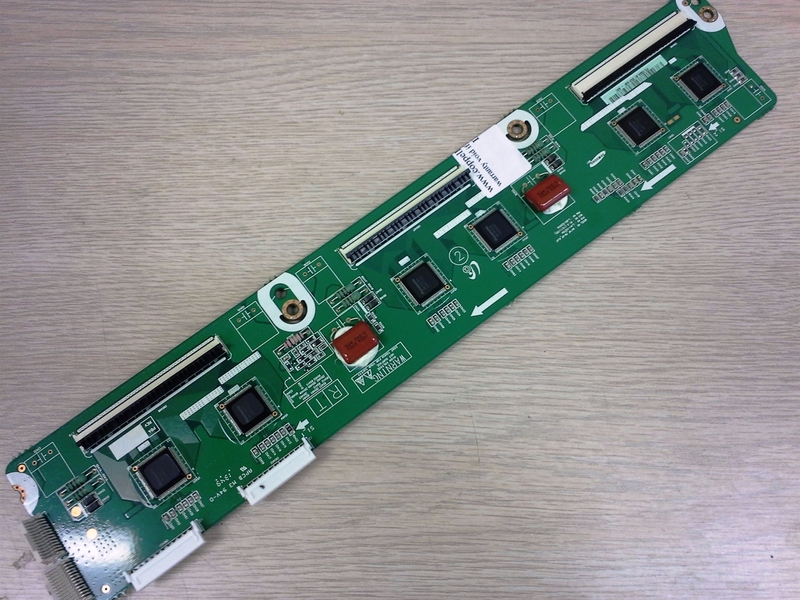 We offer no warranty and return conditoions for serviced buffer boards other than for missing or thick horizontal lines resulting from bad (missing or joined) solder joint on the ICs we've replaced. We can produce and show a video proving the board we will be sending is functional, but once it leaves our office we take no responsibility of its life span and any defects beyond the previously mentioned ones. See the SERVICED BUFFER BOARDS section for details. There are pros and cons to using serviced versus new parts. Common sense suggests that it's always better to use the new, however that is not always possible and we believe it is not even always valid; sometimes a service may account for and correct a known design or manufacturing flaw - add a voltage or current limitation component to a circuit, add a ventilation device, introduce new software containing bug fixes etc. In regards to plasma TV buffer boards the common sense is usually correct and we recommend using brand new over serviced whenever possible. One key reason for that is that what wears in plasma TV buffer boards - if anything - is the shift register ICs on the buffer. Those are the square evenly spaced blocks - usually 4, 6 or 8 per board - which corners are covered with silicone or coating. If and when those are keen to expedited aging and failing the logic says that since there are a number of them and usually only one or a few fail at the same time (very rarely all at once) then unless all are replaced at the same time with new ones, the original remaining are logically expected to have shorter life than this of a new buffer board. Manual repair, on the other hand, is such that if more than 2 ICs have to be manually replaced it is usually not economically viable to make a repair in the first place. The result of all that is that a serviced buffer board usually has only 1 or 2 ICs replaced and is normally expected a shorter life than this of a brand new board; maybe just as importantly, if a top buffer board has failed (and the bottom has not) and only the top buffer is expected to be replaced (new or serviced), then by the same logic the bottom buffer board should also be replaced or it decreases the expected time to failure of the whole assembly as well. Which is not to say that serviced buffers will have unreasonably short life time. In fact, we have no way of telling how much a serviced board will work before failing again, but we've been servicing and selling buffers for over 5 years now and we can say that it can span anywhere between immediate failure (in which case the problem is usually NOT the buffer board) and several years. From where we stand, we recommend using new buffer boards whenever possible and practically meaningful. When new buffers aren't available or are too expensive you can give a serviced one a shot to get a few more years out of your TV at a reasonable price. We wouldn't be offering them if they fail a lot, but that said we have no way of predicting when a serviced buffer will fail - hence the decreased or even eliminated warranty on them.